We finished with Valentine’s not long ago and although most of you have polished off the last bits of your bounty by now, I know there are few of you out there that want to savor your chocolate over weeks or even months. Or maybe you are building yourself a fine chocolate collection in the way that some people collect wine. Either way, you’re in luck because chocolate bars can last several years when stored properly. Years? I know, I know, chocolate doesn’t last but a couple of days in your home, but keep in mind that chocolate can become a mess in a matter of days if kept poorly. Some completely abused and bloomed bars. My wife bought these on a summer road trip as a surprise for me and accidently left them in the hot car. Although these bars were beyond edible (I tried), your chocolate won’t even come close to this disaster state if you follow a few simple rules. 1. Store your chocolate bars between about 60 and 65°F (about 16 – 18ºC). Heat will slowly drive away aroma and then flavor. In the extreme, you’ll get melting which can wreck the texture besides disturbing any art that’s molded into the bar. A fat bloom can also develop as a whitish haze on the surface of the bar that, while unpleasant looking, won’t hurt you at all. Bloomed chocolate may have poor texture, but more importantly, bloom is an indicator of poor storage. What to do with a hazy bloomed bar? Just taste it and see. Rarely will you want to throw it away. If it seems sub-par, but still edible, it can be used for baking, put into your oatmeal or crumbled on dessert. Storing chocolate under too cold conditions may disturb the crystalline structure of the chocolate and affect texture, cause bloom, or both. Chocolate makers take great care to create a bar where the cocoa butter and cocoa solids are intimately mixed. Extremes of temperature can undo this hard work. Still, I would worry less about cold than heat. Now these are ideal conditions. 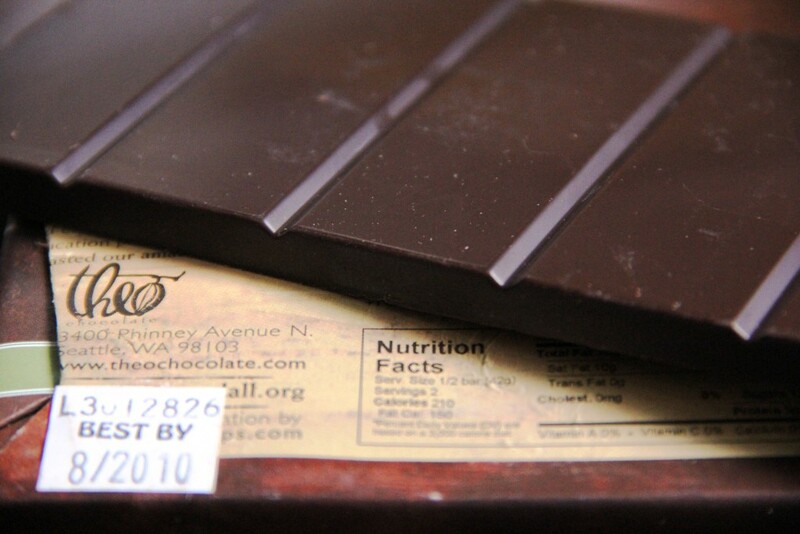 Your chocolate is not going to suddenly turn to junk at 66ºF, so don’t stress out. Choose one of the storage methods in Tips 7 – 10 and your chocolate will stay smooth and potent. 2. Store chocolate in a dry place. Ideally, the relative humidity should be below 50%. Excess moisture can condense on the bar and draw out the sugar onto the surface. A sugar bloom, like a fat bloom, won’t hurt you and simply disturbs the texture. Again, give it a taste to decide its fate – eat it, mix it or toss it. 3. Keep chocolate out of direct sunlight. Not only will it heat up the chocolate, but sunlight will also degrade flavors. 4. Avoid strong odors. Thou shalt not keep chocolate in your refrigerator next to the garlic and kimchee. Chocolate absorbs strong odors like sponge. Also keep flavored bars such as mint, coffee or Theo’s Chai Tea chocolate in a separate box away from your plain chocolate and everything will taste as it should. 5. Have no fear of the “best by” date. Here’s a confusing little secret of the chocolate industry: they put “best by” dates on the bars because packaging laws say they have to, but the dates are somewhat arbitrary. Some chocolate makers are at a loss as to what date to use, so they basically copy the other guy. Food needs moisture to grow bacteria and go bad. Chocolate contains very little moisture and most of the moisture it has is bound up with sugar. So, chocolate doesn’t really go “bad” in the sense that it can make you sick when it gets old. Does the sugar in your sugar bowl ever go bad? No. What does happen is that the fats in the cocoa butter break down under the influence of heat, light and oxygen causing off flavors to develop . With properly stored chocolate bars, nothing much happens except some flavor and aroma slowly, very slowly, go away. Even milk chocolate bars are very stable since they contain milk solids with very low moisture . Yes, the fresher, the better, but if you discover something that’s out of date, your tongue will tell you if it’s worth eating or not. Give it a taste test. 6. Keep chocolate out of reach of dogs. For some dogs, chocolate acts as a powerful stimulant and they can have a heart attack. The reaction will depend upon the dog and how much they eat. If your Chocolate Lab eats a chocolate bar, call your vet and ask what to do next. Don’t panic. They may be just fine – it depends upon the dog. I discovered this Theo dark chocolate bar hiding in my stash. Although it’s now 18 months out of date, with proper storage, it’s in good condition with no bloom. The flavor, while not the same as a new bar, is still enjoyable with floral notes and honey. I’ll be keeping these. 7. Store your chocolate in tightly sealed bags in a cooler in a dry basement. This is how I keep most of my personal chocolate stash. Put the bars into good quality freezer bags and squeeze the air out before sealing. Then put it all into a clean cooler or insulated box. You should put mint and other strongly favored chocolates in their own sealed box or a separate cooler altogether. Make sure there are no odors in the cooler or buy a new cooler for the purpose. The basement should be reasonably dry – use a dehumidifier if needed and keep the chocolate well sealed. No basement? The bottom of a closet is the next best option as long as it doesn’t get too hot. Your closet is too hot? Consider Tips 8 – 10 below. 8. Invest in a wine cooler – This is a more expensive option, but allows you to control temperature best. Most wine coolers will have a temperature adjustment, so you can get it up into the 60-65°F range. You can store wine and chocolate together, but be sure the unit is clean and dry . Wrap the bars as in Tip 7. 9. Invest in a mini fridge and dedicate it to chocolate – You know, the kind you find in dorm rooms. Set it on the warmest temperature (you can check with a refrigerator thermometer). Keep it clean and wrap the bars as in Tip 7. 10. Wrap it up well for the fridge. If you’ve come this far and you really must insist on putting chocolate in your refrigerator along with the rest of your food, I’m going to say OK, with a few conditions. Put the bars into freezer bags, include a paper towel and squeeze out all the air. Put the bags into tightly sealed food storage bins (A.K.A. “tupperware”). As before, separate the strongly flavored bars such as mint with their own bin. When it’s time to eat some chocolate, take out only the bag you need and allow it to warm up for 1 hour or more before opening the bag. This will prevent moisture from condensing on the chocolate . No matter how you store the chocolate, give it about 1 hour to warm up to room temperature before opening the bag and serving. This will bring the flavors to life. If you just can’t bear to wait that long, then take a square of chocolate and press it against the roof of your mouth with your tongue until it starts to melt. Enjoy the release of flavors that ensues. Repeat until satisfied. Should you have any questions on keeping your chocolate well, just leave a comment. We’re talking about solid bars here – not truffles or bars filled with some fruit or dairy product. Depending upon the filling, truffles can go bad quite quickly and are capable of growing mold and all sorts of maladies. We’ll discuss storing truffles in another post. Credit goes to Clay Gordon for the wine cooler idea. See C. Gordon, Discover Chocolate: The Ultimate Guide to Buying, Tasting, and Enjoying Fine Chocolate. Gotham, 2007. 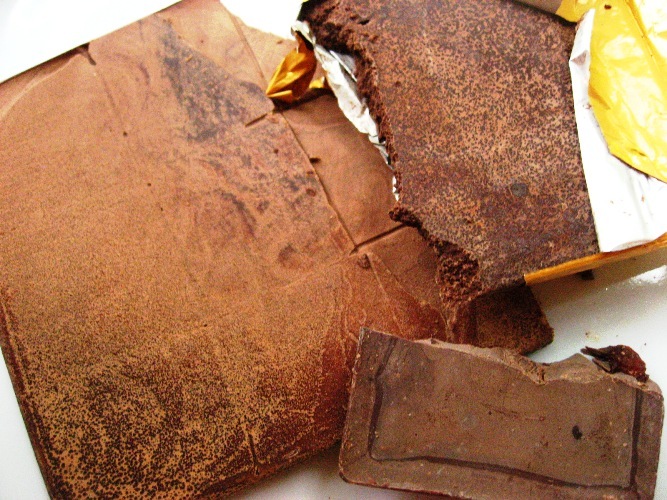 Greweling, Peter ., CMB, Chocolates and Confections, Formula, Theory, and Technique for the Artisan Confectioner, 2007, Wiley. This entry was posted in All About Chocolate, Learning about chocolate and tagged Chocolate, Chocolate Facts, dark chocolate, fine chocolate, gourmet chocolate, Milk chocolate, premium chocolate, Truffles. Bookmark the permalink. Hello Nina, sorry for the slow reply – been busy! Both temperature and humidity make tempering more challenging for sure. One place to start would be to do your tempering in an air conditioned room and bring things below 78 degrees F (26 Celsius) if you can. I feel that tempering is half science and half black magic, but you can tilt the magic part in your favor by controlling the conditions. This is a deep and vast topic, so I recommend checking the online videos by this guy: “the Chocolate Alchemist.” Good luck.